Richard Walling was born October 6, 1904, in Brookyn, NY (other sources say San Francisco, CA). He was the son of actor Will Walling and Effie Bond Walling who were vaudevillians. Walling supposed began mopping floors at Famous Players Lasky laster working his way up to assistant cameraman on the Willliam Fox Sunshine Comedies. His first job as an actor was in 1926 on the Alma Rubens film "Marriage License?" Walling worked on only 15 films total, three of which were shorts. He is seen most readily today in "Walking Back" (1928), a film he starred in along with Sue Carol about wild youth in the Jazz Age. 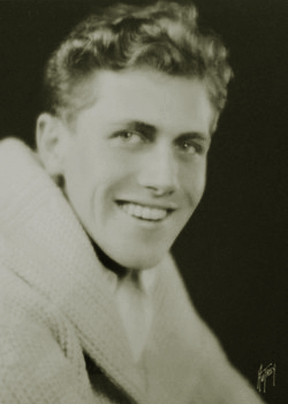 He stopped acting in 1929 to become a portrait photographer for First National Pictures, then working for Paramount and retiring from Universal Pictures in 1970. He designed and patented the very successful Walling Weaving Loom which he sold in the 1970's. He was married four times with two children by his first wife, Helen Bowler (m. 1931), two children by his second wife, Dorothy C. Stevenson (m. 1938), married a third time to Virginia Lee Finlayson, and had one child by his fourth wife, Marie Elizabeth Brill (m. 1953). Walling was also a pilot and loved flying. He passed away December 11, 1983.